It is always the time to buy ice melt before you are stuck in the snow! 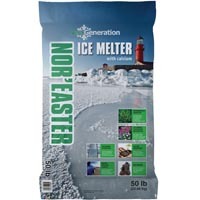 We are now carrying the most popular ice melt in PA. Note: All products must be disposed of in compliance with local, state and federal regulations. Because of the large varieties of liquids that maybe be absorbed, we do not recommend disposal procedures. Nor’Easter Ice Melt is effective to -5 degrees. Specially formulated calcium chloride blend for the Northeast application! Ideally priced for landscaper and facility management. Packed in 50 lb bags. 49 bags per pallet. Aqua blue in color for ease of distribution.